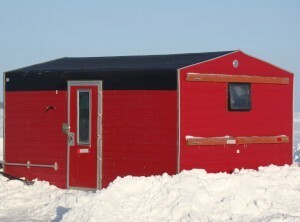 Adventure North Resort offers heated ice fishing houses for our resort guests staying in our cabins. We do not have or rent sleeper houses or have daily rentals other than what is offered for our overnight cabin guests. The ice houses are located off Pine Point of Leech Lake in Trader’s Bay and the Grand View Flats area of the Walker Narrows. We keep plowed roads open allowing you to use your own vehicle to drive the short way out. 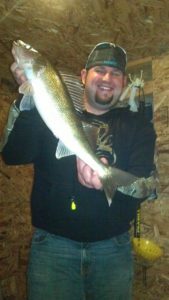 Just let us know when you would like to fish and Steve will heat up the house and open the fishing holes before you head out on the lake. If you are bringing a portable or wheel house, we’ll plow an area off the road for you to set up. If you need ice fishing gear we rent sets for $10 a person a day which includes 2 poles and tackle. We sell fresh bait and tackle here along with premium non ethanol fuel and ice. Once you catch the fish, no worries, Steve does all the fishing cleaning for our cabin guests! Just let him know if you would like the fish for dinner or packaged to take home with you and they will be ready. Our heated ice houses are dry, comfortable and have foam padded chairs and benches. We have plenty of other ways to enjoy the Minnesota winter too. There’s snowmobiling, cross country skiing, downhill skiing, snowshoeing and nature walks through Itasca State Park and the Chippewa National Forest. You’ll feel as if you’ve been transported by the beauty and the quiet. If you need a break from the outdoor action, we have some great shopping and dining in the city of Walker, MN, just 15 miles away. Reservations: A deposit of 30% is required at time of reservation. If you find it necessary to cancel your reservation after submitting a deposit, we will refund your deposit once all cabins are booked at regular rate for the date of your reservation less a $40 administrative charge and any credit card fees. Any summer reservations cancelled within 21 days of arrival will be charged the full lodging rate. Winter reservations cancelled within 9 days of reservation will be charged the full lodging rate. Early check in for cabins and ice access between 9 am and 12 PM available for 1/2 day rate. Other early arrivals not available. Please make arrangements with the office before arrival.